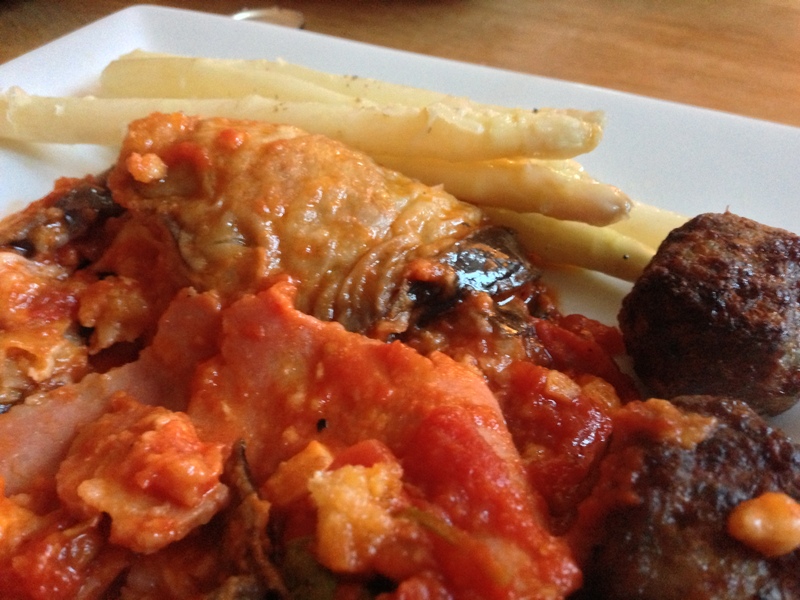 A Polish dish that’s easy to polish off! 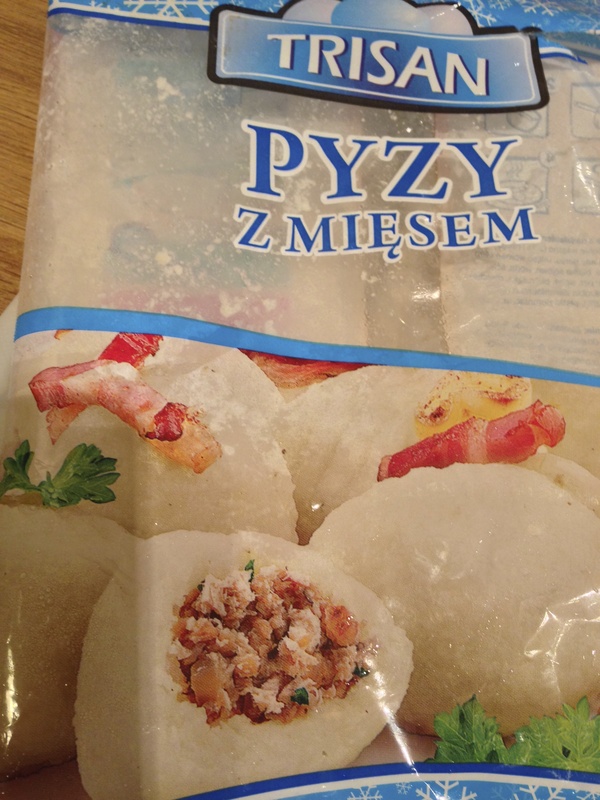 I stumbled across these delightful dumplings at Lidl recently in their Polish range – oh wow are they something! 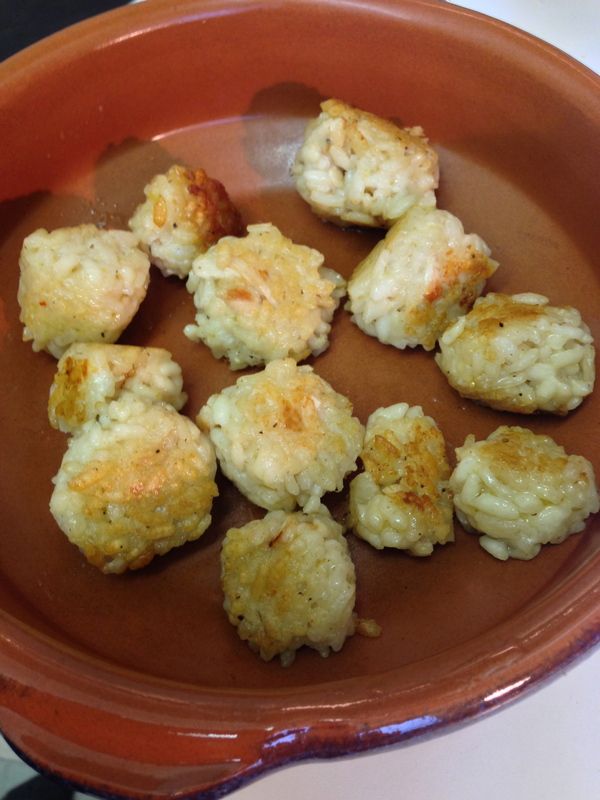 They are potato based dumplings filled with a terrific tasty mixture of pork and beef mince with leek, onion and carrot. They are called Pyzy Zmiesem – not easy to say when you have had a few glasses of vino….! Anyway, they come frozen. You just need to pop them in a large pan of boiling water with a tbsp of oil and a little salt. After about 10 minutes they rise to the top, then you reduce the heat and simmer for 8 minutes. I made a lardons and tomato sauce to accompany these beauties. I pan fried garlic, cumin seeds, crushed dried chillies and a bay leaf for a minute then added a 100 gm of lardons. As it turned a gorgeous lightly crispy colour I added a 40o gm can of chopped toms plus a little sugar. I brought this to the boil and then turned down the heat for 20 minutes and let it thicken a tad.Then I turned off the heat, popped a lid on and left it whilst the Pyzy got busy. I drained them, gently laid them on a dish, added a splash of red wine vinegar and good olive oil to the tomato mixture and ladled this silky sauce over them, adding a basil leaf or two for colour. The family wolfed it – I would love to have a go at making my own – though it would be hard to match the texture and flavour of these demon dumplings. A fine supper dish when time is at a premium! 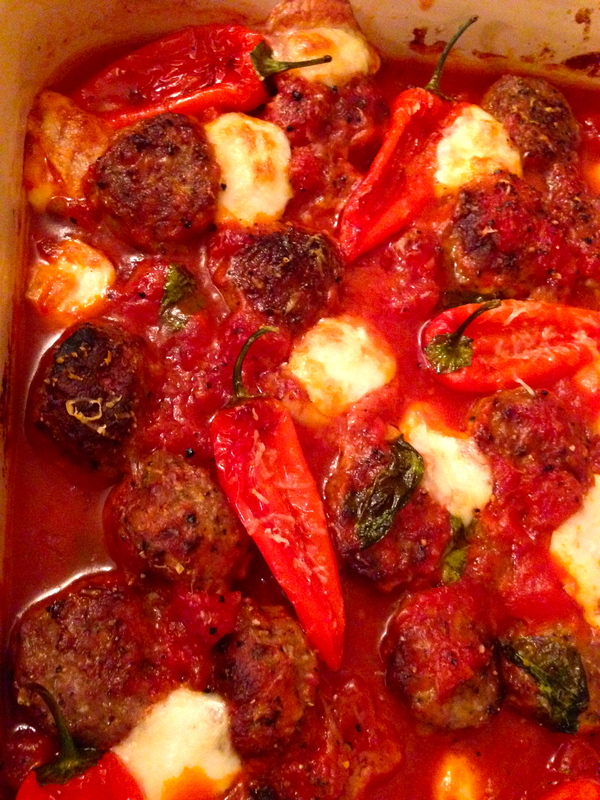 Last night’s supper was a new version of an old classic – melanzane parmigiana – my wife’s favourite. 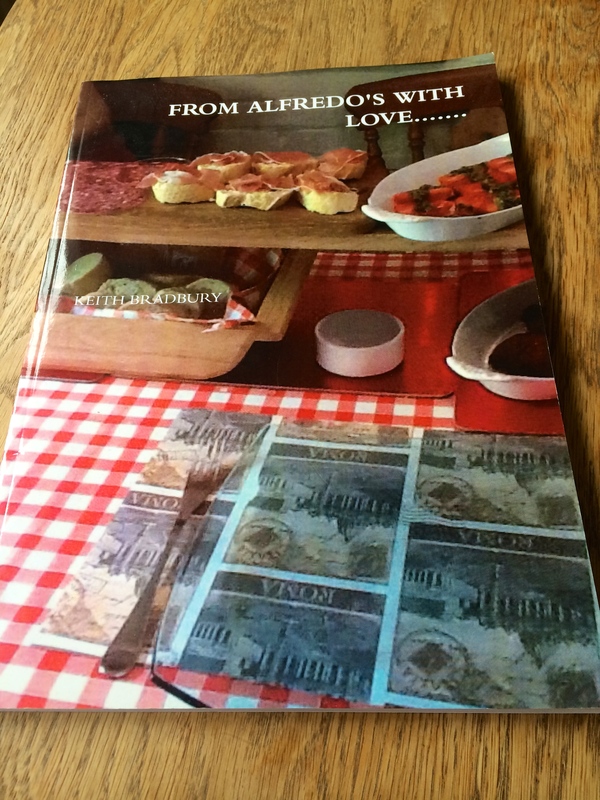 Like so many popular Italian dishes there seem to be a hundred different versions. I read about this a while ago in a book on Italy but the other day saw a recipe in a Jamie Oliver magazine I was browsing through. Had to give it a go. The key difference here is the treatment of the aubergine slices and the addition of mortadella sausage. It produces a wonderfully unctious and filling sauce. Oven set to 180c. Lightly fry the garlic and basil stalks in olive oil in a pan until lightly golden. Add the chopped toms, a little salt and black pepper and a dash of tom sauce or puree. Bring to boil and simmer for 20 minutes until thick. Slice the aubergine into 5mm rounds. Heat more olive oil in a large frying pan over a medium heat. Dip each aubergine slice first into the flour then into the beaten egg. Pop straight into the frying pan. Cook in batches – be patient! Each slice will take around a minute per side to brown up. Set to one side on kitchen paper. In a deep ovenproof dish layer up your parmigiana.A layer of sauce, a few basil leaves and then a layer of aubergine. Top with 4 slices of the mortadella. Then more tomato sauce. Pop in half of the mozzarella and more basil leaves. Then another layer of mortadella. Then more sauce over this and another layer of aubergine. Finish with the remaining tomato sauce. Cover the dish with foil and pop in the oven for half an hour. Remove fron the oven – remove the foil – add the remaining mozzarella and scatter over the breadcrumbs and a grating or two of parmesan. Drizzle over some olive oil and pop back in the oven for 20 – 30 minutes til golden and bubbling. 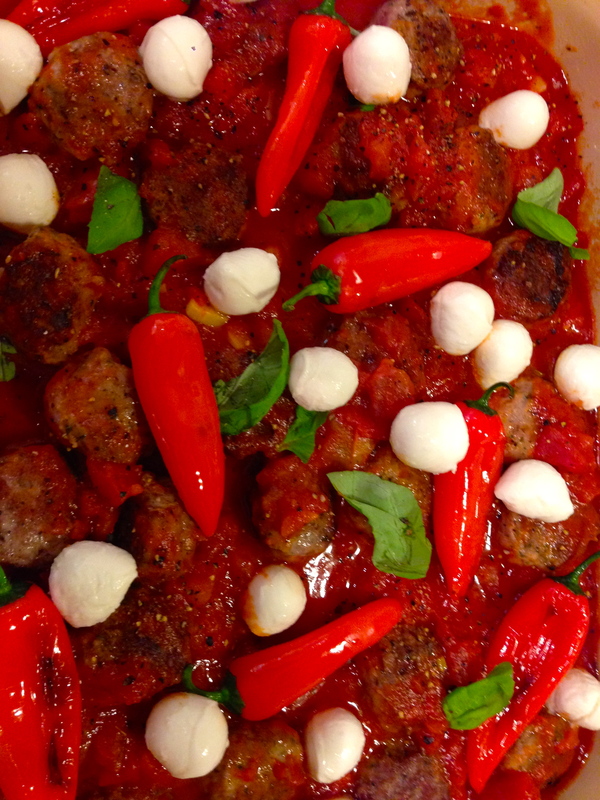 I served it with lamb meatballs – though it is a meal in itself. And i also fancied some white asparagus in lemon juice and oil so we had that too! Greedy, eh?! This was one of those days when you get into a sort of gardening groove and you want to use something that is wild and free – and there – well frankly with our garden – all around – are bags of nettles! I have been beating and nobbling and chopping the swines down for years. And then this morning I found myself reading Nigel Slater‘s Kitchen Diaries 2 with regard to black pudding – see previous posts. By sheer fluke i turned over the page and there, lo and behold, was an article on nettles! I put on a Sting cd and read on….(ouch!). The result was – I decided to involve them in tonight’s supper – I was already planning a frittata – so it just became even more interesting than normal. It is ‘rocket sciencely simple’ (not easy to say when you have had a glass or three of shiraz). Pan fry a finely chopped onion until translucent. Add a 75 gm pack of pancetta or lardons and continue til it is nicely browned. Put to one side. I used about 50 gm of nettle tops – washed and rinsed well. I pan fried them lightly in olive oil til they wilted. Set them to one side and let them cool. Nettles do not wilt as much as spinach so you get a little more. But of course – you could use spinach if you can’t get nettles. For the tomato sauce – pierce a green chilli – add to a saucepan with a good sprinkle of dried oregano, a chopped garlic clove and a finely sliced, deseeded green chilli plus at least two tbsp of olive oil. Then add a 400 gm tin of chopped tomatoes. Bring to a gentle simmer and leave for around 20 minutes with a lid on. 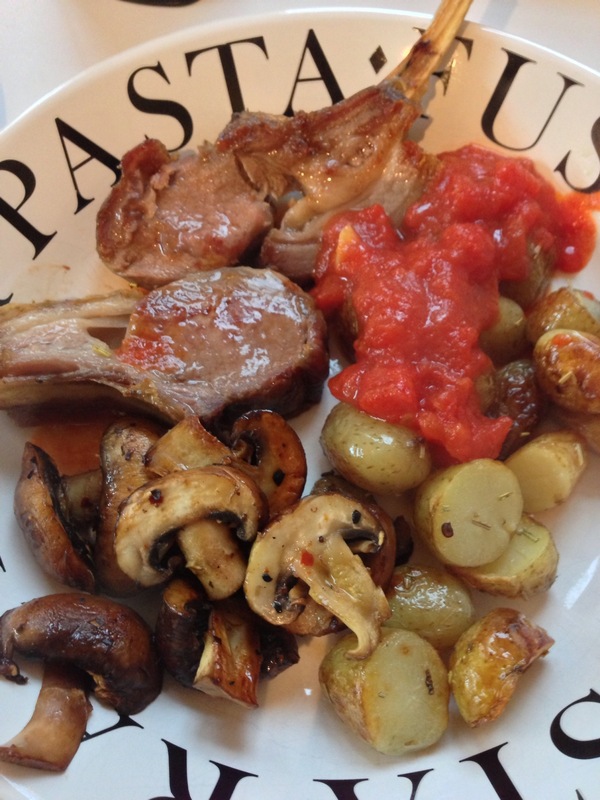 Taste – add some tom sauce if you like or a tsp of sugar. Ok – I used 500 gm of spaghetti cooked as per the packet – then drained. In a jug I popped 2 eggs and about 100 gm of milk plus some black pepper, a dash of salt and a good handful of parmesan cheese grated. I mixed this all together with a fork. I popped the spag into a large bowl and stirred in the egg mixture. Then I put a large frying pan on the stove with a dash of olive oil. 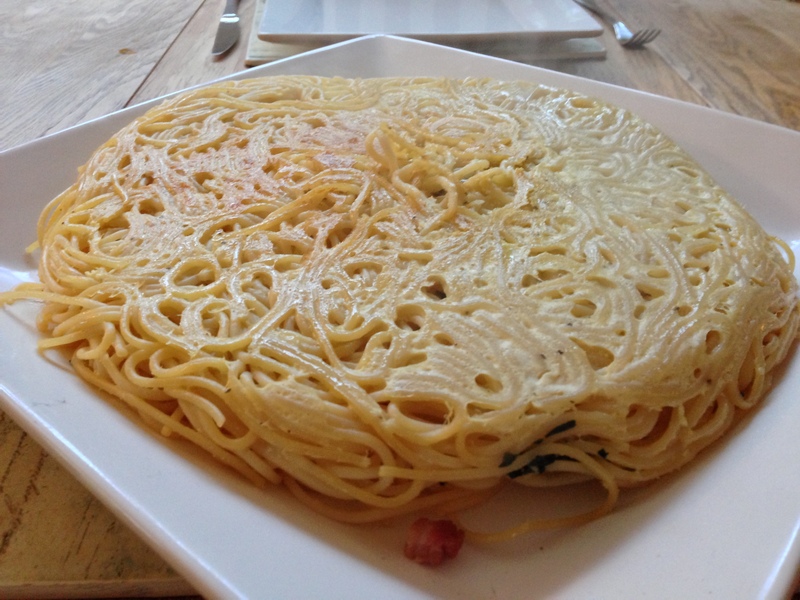 I then added half of the spaghetti mixture to the pan – flattened it down with a plate. Into the centre I added the bacon mixture and the finely chopped nettles. 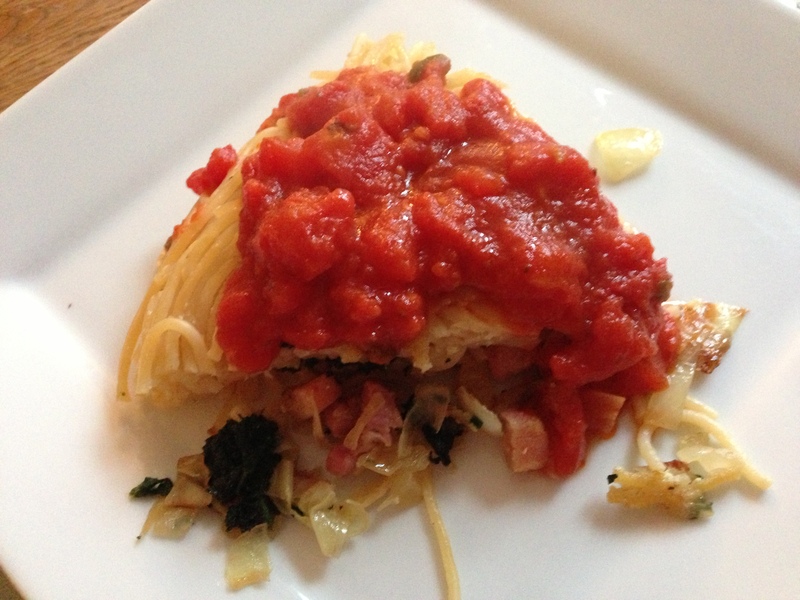 Then I carefully add the rest of the spaghetti – pressed down again with the plate – so that the filling is all covered. Pan fry it for about 5 minutes til it looks a little browned underneath – use a slice to lift it to check. Then whizz it under a preheated grill to brown the top a little. It is just a matter of being patient and attentive. Put on some good music and watch – when it it is as you want it – pop a large plate over the frying pan and carefully flip it so that the fritatta ends up on the plate. Bring to the table – use a sharp knife to cut wedges and serve with the tomato sauce. This is frighteningly simple and scarily tasty! The pancetta and nettles blend so well. A supper with real bite! Tonight’s supper…a spicy pinto bean fuelled arrabiata gnocchi dish. Fizz bang wallop! 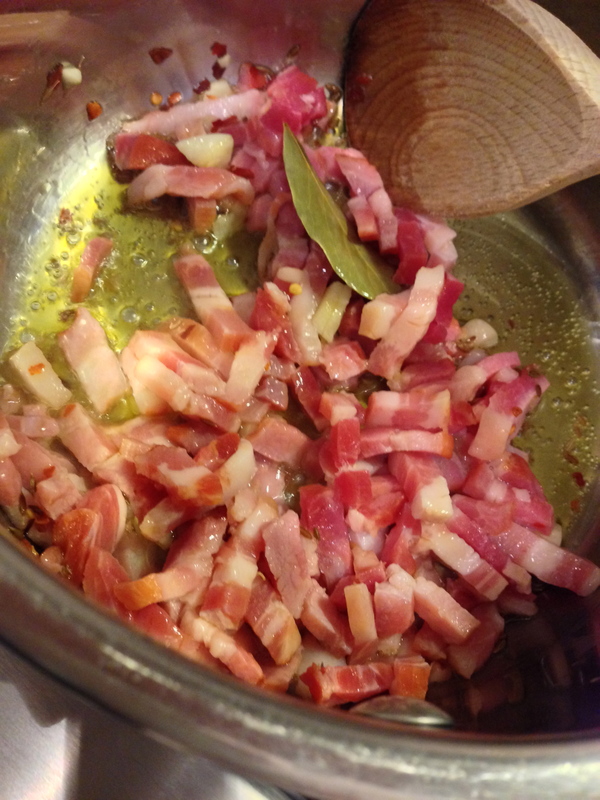 For the sauce….pan fry a sliced deseeded red chilli with some mean smokey bacon cut into strips – you could use lardon or pancetta – a tablespoon of oregano in garlic oil. Added 300gm of a good quality tomato passata, a little ground black pepper. Bring to a gentle boil, then turn down to a simmer for about twenty minutes or so. If it tastes a little bitter, add a pinch of sugar. Add a small tin of pinto beans and cook for another 10 minutes or so. Cook the fresh gnocchi for a minute or so until it rises to the top of a pan of lightly salted boiling water. Drain and add to the sauce. I then added a small handful of torn basil leaves at the last minute before I served it. On the side I served two courgettes, sliced, pan fried in olive oil and butter with some garlic and dried chiili & a little rock salt. It was a spot hitting dish for a Friday evening. Bullseye!